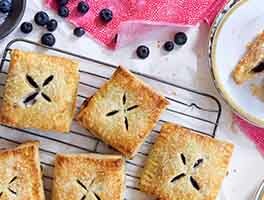 Many folks swear by the convenience and quality of a no-roll pie crust made with vegetable oil. This crisp, tasty crust is also a plus for those watching their diet, since it has neither trans fats nor cholesterol; it's also vegan. Plus, if you're intimidated by a rolling pin, this is the crust for you. This recipe makes enough for a single crust; to make a two-crust pie, see "baker's tips," below. This recipe was formerly called Oil Pie Crust. We've increased the size just a bit, to make it easier to fill a full-size 9" pie pan. Fill the crust as desired, and bake. Yield: one 9" no-roll pie crust. This recipe makes enough for a single crust; to make a two-crust pie, increase the recipe ingredients as follows: 3 cups flour, 1 teaspoon salt, 1 1/2 teaspoons sugar, 1/2 teaspoon baking powder, 2/3 cup vegetable oil, 6 tablespoons water. Press 2/3 of the resulting dough into the pie pan, then add 1 teaspoon cinnamon and 2 tablespoons sugar to the remainder. 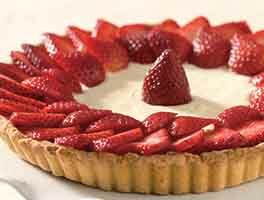 After you fill the bottom crust, break the topping into small pieces, and spread them evenly over the filling. The topping will crisp up into something between streusel, and a typical top crust. Want to make the crust with melted butter, instead of oil? Go right ahead; it'll have lovely buttery flavor. The crust will no longer be vegan, but if it's OK with you, it's certainly fine with us! Slightly softer than most recipies but still my favorite! Love the web site too! I can print, copy/ paste without having to haul and delete heavy pictures. Good designers good food! 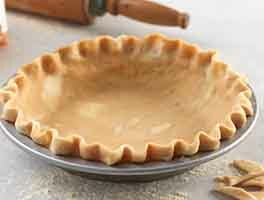 I have been trying out various pie crust recipes and was looking for a good result with less time (specifically no dough resting). This recipe is as good as any butter short crust I've made, including rough puff and using the fraisage technique. It has a different, milder flavor than butter and does not compete with the pie filling as butter crust can. I look forward to experimenting with different oils for different types of filling, e.g. olive oil for quiches, coconut oil for cream pies, etc. I deliberately did not parbake to see how the crust performed under a very wet (homemade) sour cherry filling and the crust was crisp and browned perfectly thanks to the baking powder. Thank you for this very good and easy recipe. I am a cooker not a baker and my husband LOVES apple pie. I made this recipe for Thanksgiving, with the adaptions for a top crust. I am happy to say that everyone loved it. I am making it again right now, for a single crust. Both times however, I needed to add more cold water in order to make a pliable dough. I added only a tablespoon at a time in order to avoid adding too much liquid. This is a sensational pie crust recipe. I personally suggest trying avocado oil. Also, I have to double the single crust, though, to make it one crust go as far as I want it to, but then I just plain love good pie crust. I do end up with some extra crust that way, but I'll just make that into a cinnamon and sugar crust for an extra treat. But, hey, again, this recipe is freaking fabulous. Thanks so much! We made this today and it is DELICIOUS! We have a child with allergies to dairy and this crust is just as good as the ones I make with butter. This will make Thanksgiving pies available to all ! Made this with a skeptical mind, but I ended up really liking the taste and texture of the crust. Also enjoyed how easy it was to throw together. I used olive oil and added some Italian seasoning since I was making a savory tomato-cheese-chive pie. Typically I don't mind rolling out a traditional crust, but I was in a hurry. And I didn't have enough butter for the recipe. 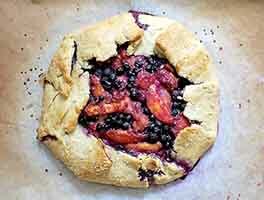 Looking forward to making this again with a sweet fruit pie using a more neutral oil or coconut oil. I thought this recipe came out more like a cross between pizza dough and a pretzel bread. Not good for apple pie in m opinion. Maybe I did something wrong? Thank you King Arthur for this recipe. I haven't had any luck with pie crust. The bottom was always soggy and usually the top crust was flat, too. I made a vegetable pie using this recipe and my bottom crust was crisp and stayed that way. My pie had liquid in the ingredients, too. The top was strudel like and crispy, I prebaked the crust for 10 minutes. It didn't shrink at all. I made using a butter/olive oil blend. I am looking forward to making sweet potato and fruit pies using this recipe. It was the best pie crust I've made and it was so easy to make. Thanks again. You all have some great recipes. I made the stuffed pizza recipe with the homemade sausage. That was really good, too.